FREE nationwide shipping! FREE to join! Businesses, organizations, government and individual users are donating their empty used laser toner and used inkjet printer cartridges to participating beneficiaries of their choice. This includes new unopened and unused original branded New Un-opened surplus imaging supplies like new inkjet and laser toner cartridges, Fuser Assemblies, All copier toner-developer-drums-fuser oil and staple cartridges. We also accept maintenance fuser kits and more for all brands and model numbers of many copiers, printers, and fax machines (used supplies are not qualified under this new surplus program). Whether the beneficiary is a school, church, non-profit organization or a personal cause, your new surplus and used printer cartridges are providing relief and necessary support while recycling it in a way to beneifit the environment and the economy. Choose from one of our recycling programs below to participate or click here to learn more about us and our recycling program. To just donate your material to charities we support, click on our donation program to register and request free prepaid UPS shipping labels. You can also help suport our program by linking to us from your website using our banners, thank you for your support. Individuals, businesses, private and public organizations can now donate and recycle used inkjet and laser toner cartridges, as well as new excess surplus imaging supplies FREE of charge using our FREE prepaid return shipping labels. For FREE shipping, please make sure you have a box full of products. Do not send single items. We would like at least 6 toner cartridges or 20 LB of material per box, or use our freight service for larger quantities of 350+ toner cartridges that are ready on pallets and shrink wrapped. Every year over 400 million inkjet and laser toner cartridges are thrown away. Recycle 4 Charity is providing communities throughout the United States (except Alaska, Hawaii and PR) with a proactive solution to waste reduction. Our innovative and cutting-edge recycling programs simplify the collection process with free nationwide UPS shipping. We offer a single facility for recycling all your printer cartridges from different manufacturers and cell phones plus small electronics. Your participation will help raise much needed cash for charities we support. By repurposing waste into reusable products, we help create American jobs and save natural resources like oil and landfill space. Register Free and request Free shipping material now - DONATION PROGRAM! 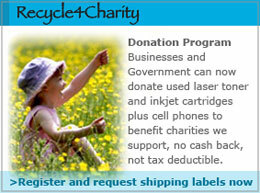 Collecting empty printer laser toner and inkjet cartridges makes a great fundraiser for non-profit charities, private companies, day care centers, high school bands, school sports teams, clubs, fraternities, sororities, cheerleading squads, girl and boy scouts, church groups, individuals and anyone that wants to select their own charity to which they wish to donate the money! We pay you in CASH, not rebates or points. 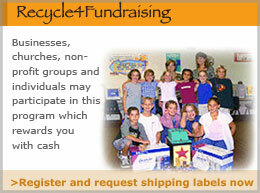 You will earn top dollar for your empty cartridges with Recycle 4 Fundraising. We accept a broader range of cartridges than anyone else which will help you maximize your earning potential. With over 400 million cartridges and cell phones thrown away each year, it's easy to earn hundreds or even thousands of dollars. We will provide free shipping labels, pallet pickup request for bulk pickup, flyers to download and all the logistical support FREE of charge. All you have to do is spread the word around your community with our customizable PDF flyers and start collecting empty cartridges and cell phones today. Register Free and request Free shipping materials now - General FUNDRAISING PROGRAM! Collecting empty printer laser toner and inkjet cartridges makes a great fundraiser for all schools, public and private. Pre-school, grades K-12, community colleges, universities, technical schools, and educational institutions qualify to join and get cash back. We pay you in CASH, not rebates or points. You will earn top dollar for your empty cartridges with Recycle 4 Education and we accept a broader range of cartridges than anyone else, which will help you maximize your earning potential. With over 400 million cartridges and cell phones thrown away each year, it's easy to earn hundreds or even thousands of dollars. We will provide free shipping labels and boxes, and all the logistical support free of charge. All you have to do is spread the word around your community with our customizable PDF flyers and start collecting empty cartridges and cell phones today. Plus you can take advantage of our free business support program allowing any business to name you as a beneficiary school to receive funds from their recyclable items without your school ever sending in a single item. You can still earn a substantial amount by just joining our free program and telling businesses and Alumni interested in supporting your school to recycle. 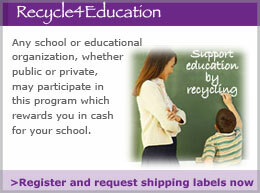 It is a win-win, they recycle and you reap the rewards in cash to help support your school. This is real and it works, try it and see for yourself, you got nothing to lose and money to gain for your school. Register Free and request Free shipping materials now - Education FUNDRAISING PROGRAM! We Promise you outstanding service, integrity and honesty!